Football players and your employees—what can they possibly have in common? As the NFL regular season nears its end, avid fans across the country are watching their beloved teams fight for playoff spots. For fans, these final few weeks act as an opportunity to see their favorite players donning the uniforms of their favorite teams. For players in the last year of their contracts, it may be the last time they set foot on the field—which typically signals the end of their career. Although football players may lead very different lives than the average American worker, they actually have a lot in common, and there are important lessons to be learned by small and medium-sized business owners who want to help their employees save for retirement and be financially successful. Although the new DOL fiduciary rule will require all financial advisers working with retirement accounts to act in the best of interests of their clients, you still need to do your homework when considering or reviewing your current 401(k) financial adviser or investment manager. Directly ask them if they are a fiduciary, what kind of fiduciary they are (a 3(21) fiduciary or, even better, a 3(38) investment manager), and ask for the acknowledgement to be in writing. Also, do your due diligence and review their professional history and track record in the industry. Ask for a copy of their FINRA BrokerCheck or ADV Part 2 Brochure, and review the disciplinary information section. Ideally, you’d be able to find these resources at no extra cost. Find a 401(k) provider or financial adviser who will do a lot more than direct your employees to their company’s website for self-service and education but who will be willing to work with your employees to help them understand their retirement account and strategy. In 2015, Seattle Seahawks wide receiver Tyler Lockett made headlines when he, in an interview with ESPN’s Kenny Mayne, reported that former teammate, Marshawn Lynch, was giving him help with his 401(k). Former NFL player Phillip Buchanon also wrote a book that year titled “New Money: Staying Rich,” in which he imparts sound financial advice to other NFL players who find themselves instant millionaires. One of his key pieces of advice was to find a good financial mentor, who is financially stable themselves and doesn’t try to make money off of them.5 Luckily for Lockett, Lynch is, by all accounts, financially stable and smart with his money. Financial education or available resources might not always go far enough. Some employees need a trusted, knowledgeable co-worker or mentor to spring them into saving for retirement—also referred to as “social proof.” Social proof occurs when some of your employees influence, mentor, or make a personal appeal to your other employees to encourage them to start planning and saving for retirement. In other words, find employees who can serve as retirement ambassadors in your company or organization. So as this football season nears its end and you spend time thinking about your favorite (and not so favorite) teams and players, also take the time to learn from their experiences with financial planning and apply the lessons you learned to your company. 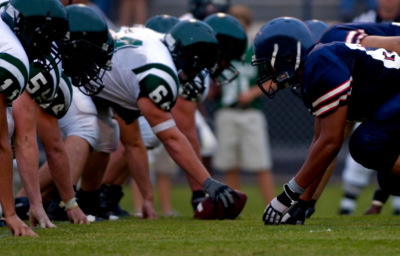 Football players and your employees have more in common than you think! 1For a fuller picture, see Pablo S. Torre’s article, How (and Why) Athletes Go Broke, or University of Michigan Institute for Social Research’s Study of Retired NFL Players. 2Rapoport, Ian. "Dez Bryant Files Lawsuit against His Former Financial Adviser." NFL.com. NFL Enterprises, July 19, 2016. Web. Dec. 27, 2016. 3“Personal Finances of Professional American Athletes.” Wikipedia. Wikimedia Foundation, n.d. Dec. 27, 2016. 4"Player Engagement Programs." Player Engagement Programs. NFL Enterprises, LLC, n.d. Web. Dec. 27, 2016. 5Kutz, Steven. "Financial Advice from an NFL Player Whose Mom Demanded He Give Her $1 Million." MarketWatch. MarketWatch, Inc., Apr. 15, 2015. Web. Dec. 27, 2016.